1st/2nd year electrical and electronic engineering undergraduates. Undergraduate mechanical engineers, computer scientists, physicists. Also industrial craft training courses. 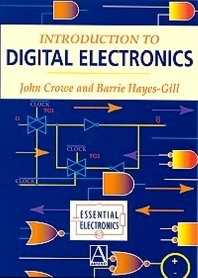 Introduction and Basic Principles - introduction Boolean algebra Number systems Combinational Logic - Introduction Sum of products representation The negative logic approach Minimalisation Common combinational circuits The 4-bit adder; a design example Systollic (iterative) arrays General sums of products circuits Hazards in combinational circuits Fault diagnosis Sequential ciruits - Introduction Asynchronous sequential circuits Flip flops Registers Counters Synchronous sequential circuits Choosing a Means of Implementation - Introduction Technology The level of integration Possible Design Routes - Discrete implementation PAL, PLA, EPLD implementation Mask programmable gate arrays Field programmable gate arrays Standard cell Full custom VHDL Digital Meets Analogue Index.